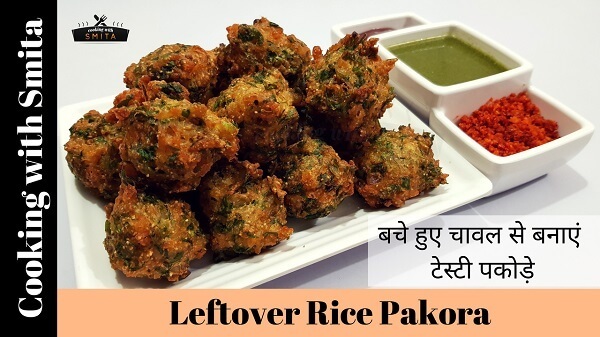 There are many delicious recipes you can make from Cooked Rice, and Leftover Rice Pakora is one of them. Here I’m sharing a very easy recipe to make crispy Pakoras from leftover cooked rice and believe me you won’t notice they are made from rice. I’ve already shared a couple of recipes made from leftover rice like Vegetable Rice Balls, Leftover Rice Cutlet etc. These pakodas are soft & fluffy from inside and crispy from outside. Take leftover rice in a bowl and gently mash. Now add all the ingredients – coriander, onion, gram flour, green chillies, garlic, sugar, pakora masala, red chilli powder, semolina and salt. Add minimal salt if you’ve already added salt while cooking the rice. The batter should not be liquidy. Heat oil for frying in a pan or kadai. Add soda and lemon juice, mix well. 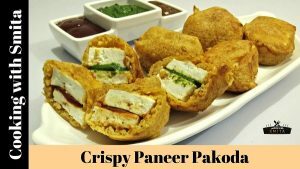 Deep fry Pakoras until they turn golden brown and crispy. Serve Leftover Rice Pakoras with Green Chutney & Tomato Sauce.